The sensitive case of the non-delivery of two Mistral class LHDs to Russia reached an end tonight, after eight months of intense negotiations. According to an official press release from the French presidency, France and Russia reached an agreement. The President of the French Republic and President Putin held talks this afternoon to confirm that France and Russia have reached an agreement to terminate the contract signed in 2011 which included the delivery of two Mistral type LHD (BPC in French). - France will have full ownership and free disposal of the two vessels. President Hollande and Mr Putin welcomed the friendly and open atmosphere of partnership that marked the negotiations. They agreed on the fact that this matter was now closed. It is not clear what will become of the two LHDs. 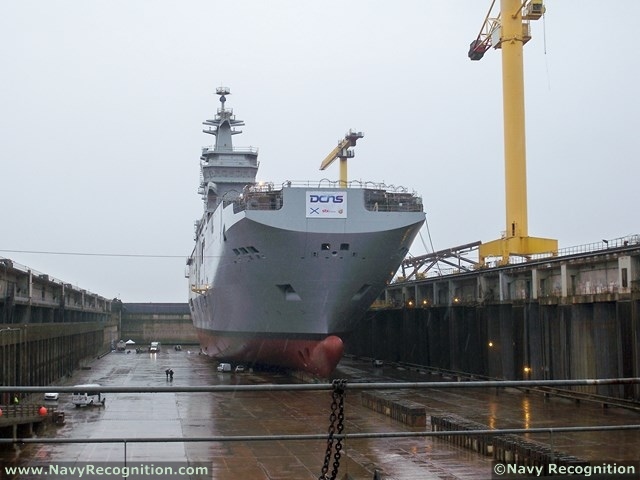 The French Navy already has three similar vessels and doesn't need additional ones. France and prime contractor and designer DCNS will likely seek a new customer for the two amphibious vessels. But they will likely have to be adapted to the end customer needs because the Vladivostok and Sebastopol were built according to Russian Navy needs and for missions in artic zones. The vessels are capable of carrying 16 helicopters, four landing craft, 70 armored vehicles and 450 soldiers, and are expected to be deployed with Russia’s Pacific Fleet. Update 1: French defense minister Jean-Yves Le Drian said this morning to RTL radio: "I am sure they will be a new purchaser, a number of countries already expressed their interest for the two vessels. The Initial price of the Mistrals was about 1.2 Billion Euros but the reimbursement is less than that amount." Update 2: French President François Hollande said the agreement includes "exactly what Russia has paid" plus "training costs". He said the transaction was a "good agreement". Furthermore, he indicated that "no penalty" will be paid by France to Russia and assured that "France will have no difficulty to find a buyer for the two Mistrals". The French President said this while attending the inauguration of the new Suez Canal today in Egypt.